Gone are the days when we knew for certain that everyone was viewing the web on a desktop or laptop computer. 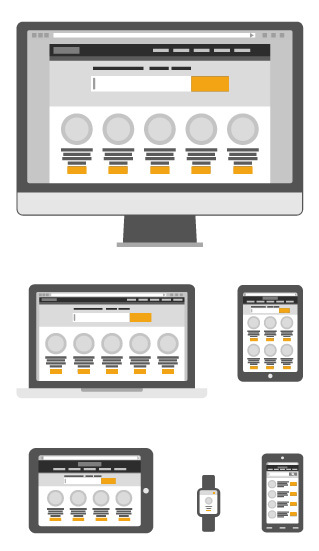 Our websites are responsive; they adapt and scale to fit the device your customer is using. We take a "content first" approach. We design to best present and support your content rather than trying to awkwardly force your message into a template. Managing your content is a breeze with live previews, multiple drafts/revisions, and scheduled publishing. We also offer content management services for those who prefer to let us handle it! Our sites are built for performance, scalability and reliability. Your clients will always enjoy a fast, responsive experience whether they come by the dozen, or millions at a time. As a SiteWell client, you’ll enjoy unparalleled, personalized service and support from our dedicated team! Your requests are dealt with quickly and efficiently. No waiting around! We're revamping our website and our service offerings. Please feel free to reach out to us if you have any questions. Get the web working for you, with SiteWell.